This picture was taken during our trip to White Island in Camiguin last December, the day after typhoon Sendong hit Cagayan de Oro City. It was the first time I learned that sea urchins can be eaten. The locals are selling it for Php 15 each. 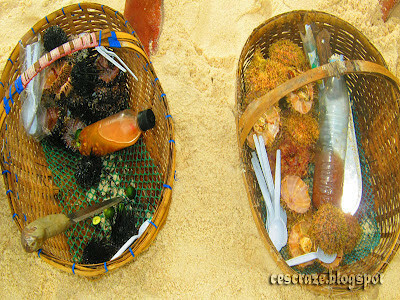 With only vinegar, calamansi, disposable spoons and swimming talent as investments, selling sea urchins is definitely an extra income for the locals so long as the marine life in the island remains rich.